I love making lists and pinning some of my favorite toddler items since I tend to forget once I get out shopping. Not long ago we shared our favorite building toys for toddlers and our favorite semi-independent toys for toddlers. Today we're going to talk about shoes! Toddler are energetic and can be hard on shoes and clothes! About two years ago I started noticing that my kids shoes were constantly getting destroyed. I would buy shoes and then 2-3 months later the toe or the soles would be full of holes. We live in California and are outdoors running around constantly, so it makes sense to have wear and tear... but not this often! 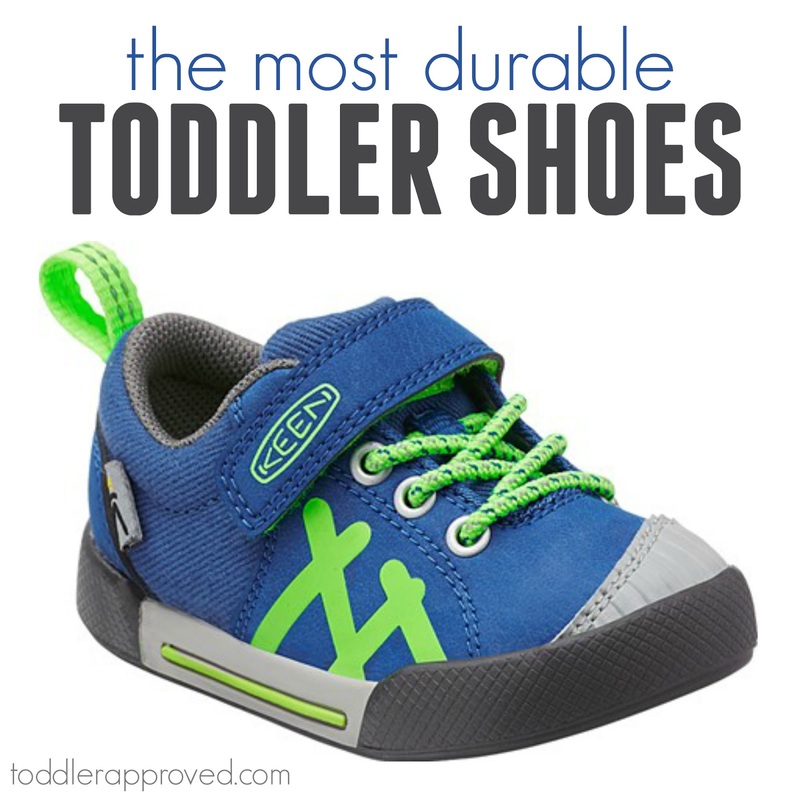 I surveyed our Toddler Approved community for some toddler shoe ideas and then we proceeded to try out a variety of brands of shoes to see which ones were the most durable. I don't like to spend a lot of money on shoes because my kids grow so quickly, but as they wore through their shoes as toddlers I realized that spending a little bit more money the first time would end up saving me money in the long run (and require me to go to the store less often too). Since toddlers go through shoes quickly and grow fast, I always recommend trying to find gently used shoes before buying brand new shoes... but I know that is not always possible! Here are several favorite durable toddler shoes (in no specific order). If you click on the name of the shoe you'll be directed to where you can purchase the shoes. This post contains some Amazon Affiliate links. Keens make sneakers and sandals. We love the sandals for running around during the summer because they allow for some good airflow. They are casual, have a breathable mesh lining, and a Non-marking rubber outsole. The rubber outsole is very sturdy and keeps the shoes durable! Natives are lightweight, injection-molded EVA shoes. EVA molds to your feet and is lightweight, washable, waterproof, and odor resistant. The thick sole and toe make them hard to destroy! They come in so many colors as well! Converse look cute and the thick sole and toe make them hard to destroy! I don't love that the white toe ends up getting dirty and scuffed... but overall the shoes stay looking pretty nice and are easy to throw in the washing machine if they get dirty. The Grib N Go and Flex toddler versions are durable and made of genuine leather with a breathable leather lining and an all natural rubber sole. They are also approved by the American Podiatric Medical Association for promoting healthy foot development. Tsukihoshi are a Japanese brand of shoes that have been around since 1873. The shoes are washable and comfortable. I love the bright colors and they are sturdy but lightweight. These sneakers are more expensive but provide good stability for toddlers. I love the colors and the velcro closures. Plae shoes comes in a variety of colors and styles. I like that you can throw them in the washing machine and that they are comfortable and supportive. Crocs are so easy for toddlers to get on and off, which is one reason why I love them! They are also easy to hose off and they are waterproof. My kids loved how you can get little charms to stick on them. Crocs also last awhile if your kids aren't too hard on them. Some of my kids wore crocs for a LONG time and some of my kids ripped them to shreds! The classic clog was always our favorite. 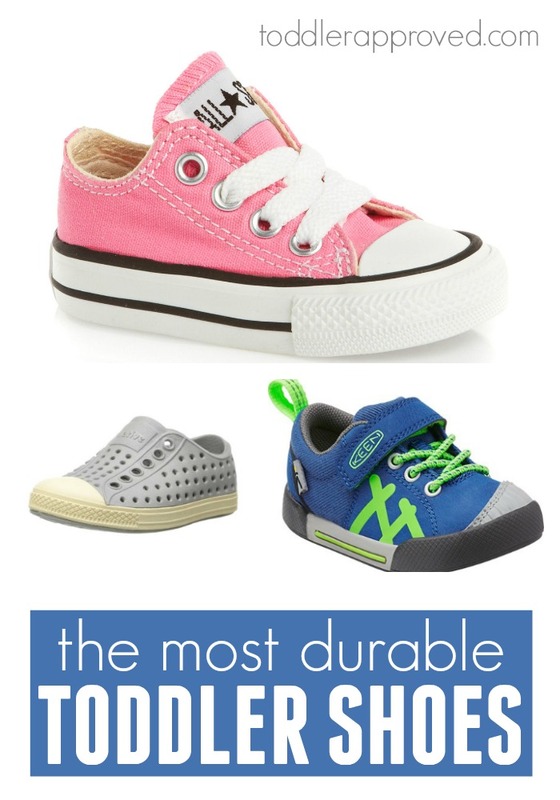 You can find some other durable toddler shoe recommendations on our shoe advice thread over on Facebook. Do you have any other favorite toddler shoes that are comfortable, sturdy, easy to clean, or durable? I am always looking for new ideas, so please pass them along! I was with you all the way up to the crocs! I'd replace those with Stride Rite, those are excellent shoes with a tread/base that isn't bulky or awkward. Ha! I hate the look of crocs but love that my toddlers can put them on themselves and that they are waterproof. Please tell me which type of Stride Rite ones you like so we can check them out? I would love to add more to this list once I try a few more out. I just got my daughter the Stride Rite made to play shoes. They are washable! I got them for her because she had hip dysplasia and her foot turns in so she gets the support that other waterproof shoes don't give!